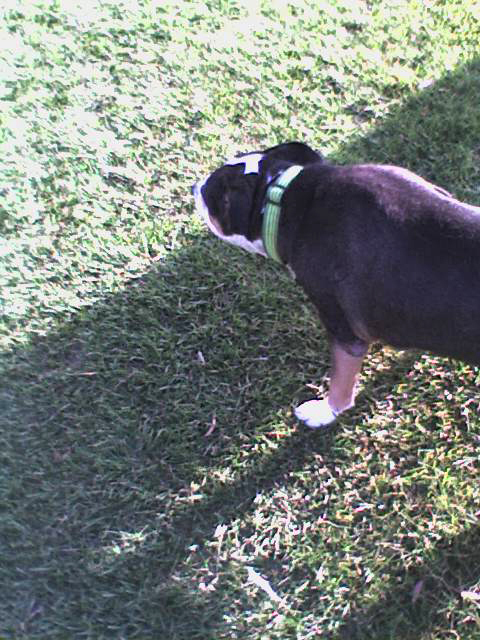 — This is a cell phone portrait of my dog, Rosie, in a park in San Diego during the last year of her life. I was kind of obsessed with writing poems she appeared in always, but as the walks slowed and her strength weakened I just became obsessed with her death and her relationship to it. I mean I realize that is a romantic idea and that poets have long had romantic ideas about dogs and death i.e. Rilke, but as a figure who occupied my “I” for almost seventeen years it was at least a deeply experienced romanticism. Here I see her pondering her mortality. If a dog could do that she would either do it in terms of light or food, the presence or the lack of one or the other. I guess the dogs or people she is surrounded by also figure into the constellation of the dog’s identity but since I mostly walked her during the day it’s patterns seemed to be the place where both of our obsessions met. She virtually died eating; having had a handful of carne asada fed her just before she went into the room. Interestingly I’ve not so much gained weight as seen it shift since she died especially around my waist and hips. I could credit it to the damage driving does to a former and now again New York body, but I think it’s about the walks I took with her for nearly seventeen years and how they inadvertently consumed calories and so now in effect my body is a memorial to hers. I have a little dead dog wrapped around my waist and hips. So walking Rosie continues daily but the longer I live again in New York where I’m always more active I can feel her presence fading. Eileen Myles’s collection of essays THE IMPORTANCE OF BEING ICELAND, for which they received a Warhol / Creative Capital grant is just out from Semiotext(e)/MIT. Eileen also writes novels (CHELSEA GIRLS, COOL FOR YOU) and libretti (HELL) and is mainly a poet (SORRY, TREE, NOT ME…) They ran St. Mark’s Poetry Project in the 80s. In 1992 they conducted an openly female write in campaign for President. They’re a Professor Emeritus of Writing & Literature at UC San Diego. They live in New York.